August 30, 2016 Dr. R. Lavigne offers up a revised predator-prey database which now contains 14,387 records. (Projects by R. Lavigne). The atlas on CD-ROM is now avaiable for free. Please visit the webpage. We thank the Ampyx Publishing House. May 09 2010 Further 600 species are photographed by Fritz Geller-Grimm, especially type material from Berlin (listing). January 01 2010 An update of the literature database is offered (listing). Because of the scattered nature of biological observations dealing with individual species within the family Asilidae, an attempt has been made by Lavigne (2008) to create a database which would place all this data in one place. The database evolved from its original 10 fields to its present number as more definitive information was published by various authors. It is now a searchable database with 24 fields as follows: GENUS, SPECIES, ORIGDESIGN, FLIGHT TIME, HABITAT, SOURCE, SOURCE2, LOCALE, RESTING, FORAGING, FEEDING, CANNIBAL, COURTSHIP, MATING, TERRITORY, OVIPOSIT, MIMICRY, ENEMIES, EGGS, LARVAE, PUPAE, REMARKS, PREDATOR-PREY RATIO & KEYWORD. The database is incomplete at this writing, but more data will be included as it is encountered. In the course of gathering and publishing biological and taxonomic information on robber flies in South Australia, it seemed that it would be useful to have a single source that future workers could quickly access. Consequently, this web site , entitled ‘Australian Asilidae’ was created . It is a work in progress which currently provides taxonomic information on most Australian asilid genera as well as photos a single representative of each genus. More photos will be added in the future. Additionally there are short summaries of biological information, including literature reviews of eggs, larvae and pupae. April 01 2009 Mike Reese is offering webpage for Wisconsin Asilidae. February 23 2009 An update of the literature database is offered, too (listing). I am happy to inform you that the extensive morphological phylogeny of Asilidae, which was part of my Ph.D. dissertation, has finally been published in the Bulletin of the American Museum of Natural History. Citation: Dikow, T. 2009. Phylogeny of Asilidae inferred from morphological characters of imagines (Insecta: Diptera: Brachycera: Asiloidea). Bulletin of the American Museum of Natural History 319: 1–175. Once I receive offprints, I am happy to send you a copy, but for now you can download a PDF from my research web-site http://www.tdvia.de/research/research_publications.html. The freely available PDF should also soon be available on the AMNH library web-site: http://digitallibrary.amnh.org/dspace/handle/2246/7. The morphological matrix (Appendix 1), one of the most parsimonious trees (Fig. 118), and the strict consensus cladogram (Fig. 119) can be downloaded electronically from the TreeBase web-site (study accession # S1958) http://www.treebase.org. In addition, the above files as well as a file with all 720 most parsimonious trees can be downloaded from my research web-site http://www.tdvia.de/research/research_data.html. In the monograph, a revised, phylogenetic classification of Asilidae is presented, which I encourage you to adopt if you work on robber flies. Details about the classification can be found in the monograph as well as on the AsilidaeData web-site (http://www.asilidaedata.tdvia.de/classification_dikow2009.html). There are certain shortcomings to this classification as I wasn't able to include all 537 Asilidae genera in the phylogenetic study, but I have outlined which genera/taxa need to be addressed in the near future to place them in the revised classification. I am planning to update the classification web-site regularly in order to add currently unplaced genera. I would like to thank all of you who made specimens available for this study or accompanied me on collecting trips, discussed robber-fly anatomy with me, and provided digital images of Asilidae. Michael Thomas and Giff Beaton, among others, kindly allowed me to use their stunning Asilidae images for the identification key and the web-site that are worth checking out. I hope you find the monograph, the web-site, and the identification key useful and will use the information provided for your research. Please don't hesitate to contact me if you need help. Please forward this e-mail to anybody you know working on Asilidae. February 22 2009 News from Rob Cannings: His site was upgraded some time ago and URLs were changed. Readers can see his personal information at: http://www.royalbcmuseum.bc.ca/Natural_History/Insects-and-Relatives.aspx?id=878 and http://www.royalbcmuseum.bc.ca/Natural_History/Insects-and-Relatives.aspx?id=2431. June 01 2008 Another 100 papers are scanned. Now 3,109 papers are already saved as PDF documents (detailed information on the PDF collection). An update of the literature database is offered, too (listing). The number of valid species increases to 7,187 this month. An update of the database is avaiable. The webpage for New Literature is closed. Please make a user query of the database (4,052 citations). November 21 2007 Mike Hackston is starting a revision of the genus Alcimus. Please get in touch with him, if you can offer material and information. Dec. 01 2006 There is a platform for Brazilian Robber Flies. Aug. 02 2006 Dr. Y. Tagawa offers some new translations of Chinese papers as PDF data file. February 19 2006 Dr. R. Lavigne offers a Biology Database for the family Asilidae. This asilid biology database began life in the original dBase format and subsequently evolved through dBase II into dBase V. It was then transformed into Access (MS Office 2000) and subsequently upgraded to 2002. It can be downloaded and imported into dBase IV & V, into Excel'97 and into Access (MS Office 2002). The database currently contains 3319 records, derived from searching the asilid literature over the past 40 years. The paucity of biological data is emphasized by the limited number of records, a great majority of which are mere habitat notations. The database will be intermittently upgraded, as well as corrected, as more biological data becomes available, or missed papers become available. February 12 2006 Michael Thomas & Chris Maier: The Robber Flies of Southern New England: The only detailed study of the robber fly fauna of southern New England was by Bromley (1946), who documented 61 species from Connecticut. Since that time, no comprehensive publications on the Asilidae of New England states have appeared. The aim of this project on southern New England asilids is to document the distribution and seasonal abundance, summarize the conservation status of species perceived to be rare or imperiled, and create an identification guide with illustrated keys and species accounts to promote further study of this family. mikethomas206@comcast.net & maier890@comcast.net. February 04 2006 Barry Flahey a Canadian artist, has provided readers with a well drawn illustration of the life history of Proctacanthus milbertii. January 13 2006 Jason Londt has just produced an upgrade of the Catalogue of the afrotropical Asilidae. October 31 2005 New project: Developing graduation project entitled Taxonomic review of Cnodalomyia Hull, 1962 (Diptera, Asilidae, Asilinae). The genus now includes just one species (C. obtusa Hull, 1962) from Itatiaia Rio de Janeiro. The Museu de Zoologia da Universidade de São Paulo has a big series of non identified material (including material from different Brazilian regions) and also some specimens from the type series. The project aims to present redescriptions of the genus and type-species (including spermathecae), to increase the known geographical distribution of taxa and also describe the possible new species. Any assistance in this project you can afford me would be a great asset. At the very least, I'd like to be sent any locality data you possess for your Neoitamus specimens as I am constructing a locality database, which will enable me to more easily locate live specimens. My e-mail address is asilid@gmail.com and thanks you all very much in advance!. October 16 2005 Yuji Tagawa photographs the type material of 43 species of the Bernice P. Bishop Museum, Honolulu and adds the images to our database. After years of studying, Charlie summerized the results of his extensive work on South Korean Asilids. After The Japanese webpage, it's the second webpage of an Asian country and its robber fly fauna. So we will be able to get a better knowledge of this region. September 17 2005 Pavel Andreyevich Lehr died on 15 Sept. 2005. It's with great sadness to hear that an important dipterist left us. His contributions to the knowledge of Palaearctic robber flies are outstanding. Dr Kumar Ghorpadé writes: "Dear Dipterist colleague, Greetings. I am seeking the collaboration of specialists researching Oriental families of two-winged flies (Diptera). This is a prelude towards exploring the feasibility of finding the means to be able to publish several fascicles of a projected multi-volume treatise titled DIPTERA INDICA,’ which will update the biosystematics of all families of true flies occurring in the Indian sub-continent. Such joint researches with me should include results of random collections and targeted surveys done so far, by examining available material in museums, etc., from other countries besides India, viz., Afghanistan, Tajikistan, Pakistan, Nepal, Bhutan, SE. Tibet, Burma, Bangladesh, Sri Lanka, the Maldive Islands and the Chagos Archipelago in the Indian Ocean, as well as marginal areas of neighbouring countries also, like SE. Iran, SW. China, W. & peninsular Thailand, and N. Malay peninsula. My own ongoing sampling surveys all over India are being carried out to enlarge my existing personal collection of over 100,000 specimens of Diptera. I would be pleased to arrange study loans, from my collection, of select families to interested Dipterist colleagues interested in collaborating, on their request. I could also publish, quickly (in 1-5 months only), manuscripts of such collaborators in my journal Colemania, based on research done on my collections, as well as on those housed in European, North American, Japanese and other world museums, including the limited material available in a few institutions in India and some other countries in S. & SE. Asia. I may also be able to help provide type data of such specimens housed in Indian museums. Since 1976, I have assisted and organized collecting expeditions in India for foreign specialist colleagues and would be extremely pleased to arrange such trips, targeted to sample the remaining undisturbed habitats here. This will entail permissions from the Ministry of Environment & Forests, Government of India, and State Forest Departments, which will become easier if these sampling surveys are conducted even as short-term, low budget, bona fide, ad-hoc, research projects. Dipterist collaborators then can work such projects in coordination with me and the Department of Entomology, University of Agricultural Sciences, Dharwar, Karnataka, India, where I am now a recognized P.-G. Teacher and Research Associate in Systematic Entomology. The web-site contains identification tools (a dichotomous key and a matrix-based key), an atlas illustrating the geographical distribution, and descriptions, diagnoses, and specimen data for every species. Because I transformed my original publication, which was published in African Invertebrates (2003; 44(2); 1–131), not all species are illustrated with colour photographs and the identification keys are not yet illustrated. For future projects this will be done and I will be updating the Euscelidia revision with these features. As biodiversity is threatened and we are trying to describe and identify it using taxonomic revisions, I see this online identification tool for 68 species of Euscelidia, which are mostly distributed in developing countries in the Afrotropical and Oriental regions, an important step towards this goal. The World Biodiversity Database contains only a few projects so far, but with the continuous input from taxonomist we can improve our knowledge of biodiversity and make access to this knowledge and the resulting publications readily available to scientists working in the biodiversity-rich countries. 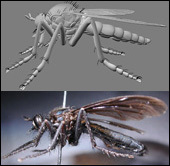 May 16 2005 A three-dimensional model of a robber fly is offered by Felix Grimm. It bases on the species Dasypogon diadema and will be used for morphological studies and the terminology. Mar. 11 2005 Appeal: For getting a better access to literature, a collection of PDF documents is being developed. Please send such data files to Fritz or Torsten. You can ask for existing PDFs or getting the complete collection on DVD. Mar. 10 2005 Note: The checklist for the Asilidae of Idaho is now at a new URL: http://www.albertson.edu/campus/community/museum/IEG/Pubs.html. Jan. 30 2005 In an effort to better present a detailed summary of the phylogenetic relationships of taxa of Asilidae a new web-site has been created. These are hosted on another server and maintained by Torsten Dikow. Here you will find information on the latest phylogenetic studies but also summaries of what has been published previously. Also, the list of target taxa and available specimens in ethanol for molecular studies will be residing here. Jan. 08 2005 Jason Londt has just produced an upgrade of the Catalogue of the afrotropical Asilidae. Dec. 20 2004 Danny Wolff offers some new photographs of European species (visit the database of photographs). Nov. 03 2004 Torsten Dikow informs on the 6th International Congress of Dipterology in Fukuoka in September 2006 (visit our webpage). June 17 08 2004 Jason Londt has just produced an upgrade of the Catalogue of the afrotropical Asilidae. April 08 2004 Fritz Geller-Grimm has added new photographs of nearly 120 taxa of the ZMHB collection (most of them are types), please visit the database of photographs. The database includes now 11 per cent of the valid species. April 08 2004 Torsten Dikow and Fritz Geller-Grimm have just produced an upgrade of the webpage on the phylogeny. 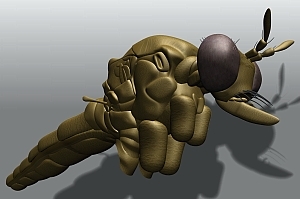 March 20 2004 A three-dimensional model of a robber fly is in preparation by Felix Grimm. It bases on the species Dasypogon diadema and will be used for morphological studies and the terminology. March 05 2004 Some colleagues are using LUCID, which is a flexible and powerful knowledge management tool that helps users make an identification or diagnosis. Some few keys are avaiable and it is necessary to test them. Please follow this link. February 23 2004 The number of valid species increases to 7,003 this month. An update of the database is in preparation. February 03 2004 Dr. R. Lavigne sends the English translation of "Adamovic (1950)". You can download the Word97 documents [transl10.zip]. January 19 2004 Marcela Castelo from Argentina finished doctoral thesis about the biology of Mallophora ruficauda. The abstrat is avaiable on this server. January 11 2004 Dr. R. Lavigne sends the English translation of "Lehr (1964)". You can download the Word97 documents [transl12.zip]. November 29 2003 Torsten Dikow has just produced an upgrade of the webpage on the phylogeny. October 27 2003 Dr. R. Lavigne offers up a revised predator-prey database which now contains 13,445 records. (Projects by R. Lavigne). October 03 2003 There are some new translations from Dr. R. Lavigne and Fritz Geller-Grimm. September 30 2003 The "Photographic atlas and identification key to the robber flies of Germany (Diptera: Asilidae)" is published now. September 27 2003 There is a very interesting webpage on the Japanese Asilidae by Dr. Yuji Tagawa. August 24 2003 Key to the Nearctic genera by Jorge N. Artigas et al., compiled by F. Geller-Grimm. This will be the base for the photographic atlas in 2004. August 17 2003 Dr. R. Lavigne sends the English translation of "Lehr (1958)". You can download the Word97 document [transl10.zip]. 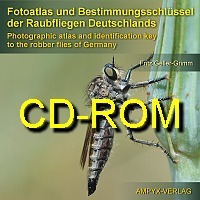 July 26 2003 Photographic atlas and identification key to the robber flies of Germany (Diptera: Asilidae) by F. Geller-Grimm - includes photographs of 81 taxa from Germany (1,900 images in all). It will be published in Oct. 2003 on CD-ROM. If you are interested in further information, please read the introduction. July 25 2003 Dr. R. Lavigne: The University of Wyoming has again changed the URL for my two bibliographies [SM-36 & SM-55]. The web page that comes up doesn't redirect the reader. The new URLs are as follows: SM-36 and SM-55. June 11 2003 Dr. R. Lavigne sends the English translation of "Masaru (2001)" and "Nishimoto (2001)". You can download the Word97 document [transla8.zip]. May 20 2003 Dr. R. Nelson offers some new photographs (visit the database of photographs). Mar. 26 2003 Dr. R. Lavigne sends the English translation of "Harusawa (2002)". You can download the Word97 document [transla8.zip]. Mar. 16 2003 Dr. K. Lunau offers some new photographs (visit the database of photographs). Jan. 12 2003 Dr. R. Lavigne offers up a revised predator-prey database which now contains 13361 records. With his permission, it incorporates 838 prey records provided by Dr. Greg Daniels, most of which are unpublished. (Projects by R. Lavigne). Jan. 12 2003 Dr. R. Lavigne sends the English translation of "Yoshida, H. (2002)". You can download the Word97 document [transla8.zip]. Amorim, D.d.S. & Tozoni, S.H.S. (1994): Phylogenetic and biogeographic analysis of the Anisopodoidea (Diptera, Bibionomorpha), with an area cladogram for intercontinental relationships. - Revista brasileira de entomologia 38(3-4): 517-543; Sao Paulo. The Zoological Record Vol. 132 (1995/96, cition No. 71) contains the following information on page 446 (Asilidae): "Carreraia referred to the new subfamily Lobogastrinae". Result: This paper contains no information on Asilidae and Lobogastrinae is a new subfamily for the Anisopodidae. Dec. 07 2002 Outdoor Photographs: Dr. Robert Lavigne offered additional photographs of the biology of robber flies (visit the database of photographs). Please visit the database of photographs. Congratulations! Your site has been selected as a "Best of the Bugs" WWW site by the University of Florida's Entomology and Nematology Department. This means it is judged to be in the top 5% of insect- or nematode-related WWW sites by a committee of professional entomologists and nematologists. These professionals agreed that your site adds significantly to the knowledge of entomology and nematology available on the WWW. With the aid of interested specialists, a public database of photographs concerning robber flies is being developed. If you have digital photographs or scanned images of robber flies, please add them to this database. Leslie, M. (2002): Fierce Flies. - Science 296: 2303; Washington, D.C. [PDF data file]. May 30 2002 Torsten Dikow: Everybody of us knows that there is hardly any knowledge of the phylogenetic relationships within the diverse Asilidae. Because I am not only interested in these fascinating flies but also in phylogenetic systematics I will analyse the phylogenetic relationships within the Asilidae based on morphological and molecular data in my Ph.D. thesis. I will start this project in August this year at Cornell University (Ithaca, NY, USA) in connection with the American Museum of Natural History, New York City. Apr. 18 2002 Database: Torsten Dikow and Fritz Geller-Grimm are working on the databases (genera, species, bibliography). We are currently adding further information and therefore it is not possible to offer new updates at this time. Apr. 18 2002 OFFER: For those with an inadequate internet connection, a CD-ROM with the complete webpage is available. Please contact F. Geller-Grimm. Apr. 18 2002 New structure: For a better overview, new citations are added on the top of each page (no longer alphabetically sorted). (New Literature). Mar. 10 2002 Dr. R. Lavigne offers an update of his predator-prey database (Projects by R. Lavigne). Dec. 14 2001 Dr. Yuji Tagawa offers a webpage on Japanese Asilidae. Dec. 08 2001 If you have an interest in digital photography, please have a look at a new webpage. Aug. 27 2001 The Robber Flies of Kansas web site has been moved. Aug. 12 2001 A glossary of terms is in preparation. Please check the proposed terminology. May 24 2001 A collecting trip to South Illinois: Asilidae. May 22 2001 Dr. R. Lavigne and the co-authors have just placed on the Internet "Checklist of the Asilidae of Idaho". The URL is: http://www.personal.psu.edu/users/p/x/pxb32/ieg/IEG.html. Click on "Recent Publications by members." It is a PDF file and you need Acrobat Reader to read it. The URL is temporary and will be changed before the end of the year, unfortunately. However, he hopes to have a permanent home for it by then. Apr. 15 2001 Dr. Joseph-Jean Musso gave the permission to offer his dissertation on CD-ROM (written in French). All pages are saved as "TIFF"-data files by Fritz Geller-Grimm. If you have an interest in this fundamental work, please contact F. Geller-Grimm. Oct. 29 2000 Mark van Veen offers some information on his new projects. Jun. 14 2000 The Asilidae Homepage has a new structure, please note "Projects" and add your own information. Jun. 09 2000 Some new citations are offered by Roy J. Beckemeyer, David Clements, and Danny Wolff. Jun. 04 2000 Dr. R. Lavigne offers his predator-prey database (Projects by R. Lavigne). Apr. 24 2000 Dr. R. Lavigne: The University of Wyoming has reissued SM-36 entitled "Asilid Literature Update 1956-1976 Including a Review of Robber Fly Biology (Diptera: Asilidae)" and placed it on the Internet in the same location as SM-55 and in the same .pdf format requiring Acrobat Reader. Since it has been unavailable for some years, they were interested in having it on the Net as a companion piece to SM-55, especially because of the review of robber fly biology. Jan. 12 2000 The "Database" has a new structure, it now contains questionnaire forms for the catalog of species, the abbreviations, the catalog of genera, the translations, and the bibliography. Have a look at the offered database and tell me the problems with the use of it. The headlines of the answers are in German (a handicap of the provider). The "Catalog of Species" now contains the complete listing, including of the Nearctic catalog. Dr. Eric Fisher is working on this catalog; most workers are aware of the manuscript. His proposed changes in nomenclature are'nt included in the database, but the changes in the distribution of species are. Jan. 03 2000 The abbreviations for the countries (in the catalogs of species) have changed, e.g. those for the States of the USA. Please have a look at "species.htm" and "abbrevi.htm" (65 k). A map with all abbreviations is also availabe on "abbrevi2.htm" (105 k). Jan. 01 2000 Dr. P. Lehr publishes two new papers (1998: Cyrtopogon and 1999: Far East). Have a look at "New Literature". Dec. 28 1999 Dr. R. Lavigne adds 202 new citations to the bibliography (now: 3380 citations). You can download the database on "literatu.htm". Dec. 06 1999 The next meeting of the Central European Dipterists will start in June´2000. Please have a look at the web page. Aug. 23 1999 A mailing list for robber flies is presented by Dr. Stepen W. Bullington. Aug. 16 1999 A list of generic names in Asilidae is in preparation by Dr. Jason G. H. Londt. Please have a look at the manuscript. Additional information on "Aug. 30 1999"
Feb. 25 1999 The type catalog of the Senckenberg museum, Frankfurt a.M. (Germany), is obtainable now. Dec. 29 1998 Dr. R. Lavigne send the first correction of the literature database. The results are saved now. Please download the new list [Size: 223 KB]. Dec. 25 1999 The next meeting of the Central European dipterists starts in June´99. Please have a look at the web page. Joseph, A.N.T. & Parui, P. (1998): Fauna of India - Diptera (Asilidae) Part I. - Calcutta: Zoological Survey of India: 278 pp. ; ISBN 81-85874-07-7 [$ 35]. Oct. 19 1998 Please check the provisional key to the Central European species of the genus Dioctria Meigen and send your remarks to F. Geller-Grimm. Aug. 24 1998 Jason Londt: About his new research project (Stenopogon) from the Afrotropical region. Oct. 07 1998 Dr. R. Lavigne presents his English translations of some interesting papers (especially the biology of robber flies). You can download the Word97-file on the following link: http://www.geller-grimm.de/catalog/transla.htm. The database will be expanding permanently. It would be highly desirable that a workshop for Asilidae can be arranged on the next congress in Australia (2002).